This is something I started many, many moons ago, and have never quite finished. The idea was to come up with an “ABC” book based on automobiles and alliteration. I also wanted to try to populate the images with items that start with the letter… (in this case, “A). Some aren’t “hidden” (like the “Autobahn” sign), but others may be easy to overlook. There are 16 items hidden in this particular image. I’ll be posting these letter by letter on Tuesdays. Spoiler alert… I’ve only “finished” to “J”, with sketches for K, L, and M. Let me know what you think (and find!). Enjoy! P.S. The cars don’t count towards the 16 hidden items. P. P. S. A sharp-eyed viewer has found another “A” item – so there are 17. Apologies – it’s been so long since I did “A” I’ve had to search the things myself! 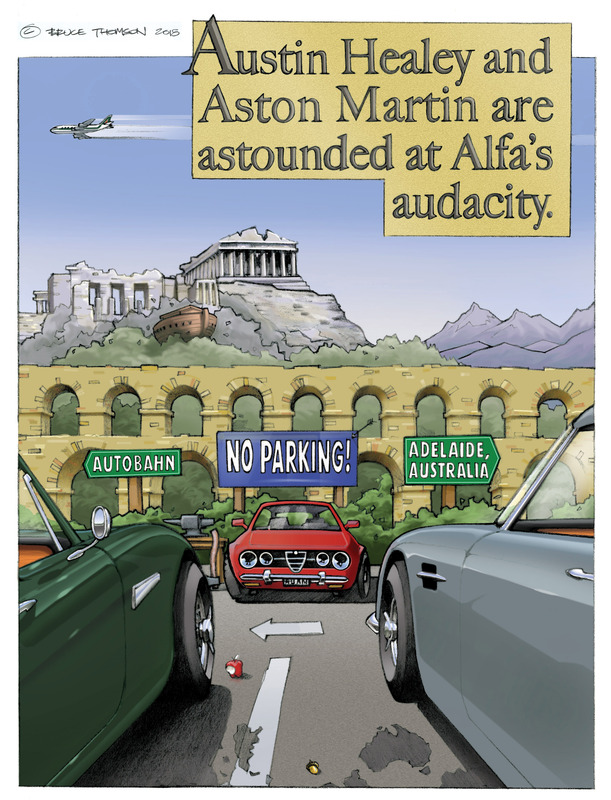 This entry was posted in Illustration and tagged Alfa Romeo, Aston Martin, Austin Healey. Bookmark the permalink. Bruce – this is genius! I loved it and had far too much fun with this 😀 Think I am missing at least one though. Will have another look later. If this was a book I would buy it. Reminds me of a game I play on long trips – trying to complete an alphabet of cars spotted – the easy version is to allow either make or model – the hard version is to allow makes of cars only. At the end of the trip, I count which letters were left over. The arches do count – you’re sharp! I had thought that there were 16 items but have discovered (through another commenter) that there are 17… been so long since I did this that I’ve forgotten some of them! ha! hadn’t thought of air intake…!